In the spirit of ideas worth spreading, TEDx is a program of local, self organized events that bring people together to share a TED-like experience. At a TEDx event, TEDTalks video and live speakers combine to spark deep discussion and connection in a small group. These local, self-organized events are branded TEDx, where x=independently organized TED event. The TED Conference provides general guidance for the TEDx program, but individual TEDx events are self-organized. 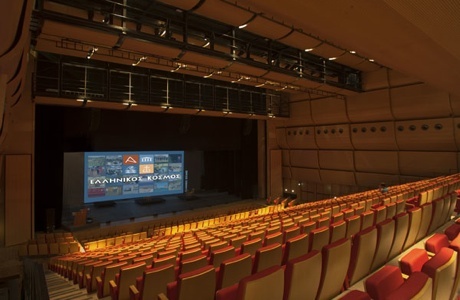 TEDxAthens, which took its license in May 2009, is one of the first TEDx events worldwide. TEDxAthens seeks to develop and leverage the TED experience at a regional level, bringing together innovators and inspirational speakers in Athens, Greece. TEDxAthens was developed by “TEDx-ster” Dimitris Kalavros-Gousiou and Abrahaam Tsoukalidis. The TEDxAthens Organizing Committee includes: Afroditi Manta, Maria Kokidou, Marineta Kritikou, Angelika Daskalopoulou, Eleftheria Deko, Filimon Papapolyzos, Nancy Mallerou, Dimitria Themeli, Sofia Belouka, Dimitris Kokkoris, Stathis Haikalis, Dimitris Kalogeropoulos and Konstantina Zoehrer. Faithful to the vision of the Foundation of the Hellenic World, the “THEATRON” has the ambition of housing contemporary artistic expression and to constitute, combined with the other infrastructures of Hellenic Cosmos, a significant cultural centre in Greece.